The world is on the cusp of transformation in which data, devices and applications will connect medicine and people seamlessly and securely. Connected Healthcare maintains the personalized healthcare by reducing resources and increasing demand of quality healthcare services. Connected healthcare solutions merge information from different aspects of a person’s life to give the complete data related to health that comprises of biological, genetic, medical, lifestyle and sentiment/mood data, than produce patient-centered care decisions. For instance, our research on diabetes app market found that the four most important features of apps that are available online are: Insulin and medication recording, data export and communication, diet recording and weight management. The revolution in healthcare connectivity offers promising next generation solutions. M-Health devices include blood glucose meters, cardiac monitors and blood pressure monitors, which will be the main drivers of growth. Pulse oximetry, neurological monitoring, sleep monitors, and wearable fitness and heart rate meters will also make up this segment in the forecast years. The advancement in connectivity technology along with the introduction of IT healthcare is also awakens the opportunity for connected healthcare devices. 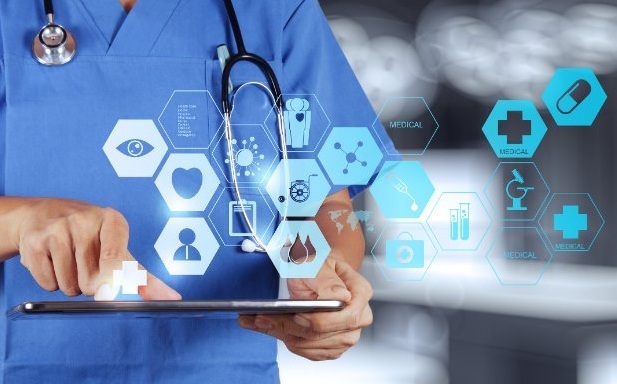 The growing need of connectivity in healthcare infrastructure to utilize the resources is also augmenting the market growth of global connected healthcare market. The global connected healthcare market is anticipated to reach USD 150 billion by 2024 due to persistent geriatric population as elderly population is highly susceptible to acquire several health disorders as compared to younger adults. According to the World Health Organization (WHO) projections, global geriatric population is anticipated to reach around 1.5 billion by the year 2050. Thus, a consistent rise in geriatric population would boost the growth of connected healthcare market. On the basis of type, M-Health services hold the largest market share followed by M-Health devices and E-Prescription. M-Service, which includes wellness, prevention, diagnostic and monitoring services expected to be worth USD 50 billion by 2024, growing at a CAGR of 30% over the forecast period i.e. 2016-2024. The global m-health devices market will grow at an average annual rate of 38.6% over the next five to six years. Globally, North America holds the largest market share for global connected healthcare market which is expected to grow at the CAGR of 30% over the forecast period i.e. 20016-2024. Middle East and Africa is the biggest factor in the global connected healthcare market anticipated to reach USD 10.2 billion by 2024. Africa is the fastest developing geography and is projected to develop at the rate of 27.5% by 2024. Asia-Pacific connected healthcare market is expected to be the fastest growing market and tends to reach at USD 25.8 billion by 2024. Europe being the second largest market for connected healthcare is anticipated to grow at a compound annual growth rate of 27.6% during the forecast period i.e. 2016-2024. Global connected healthcare solution providers are focusing towards the business model of business to business (B2B) on the back of growing demand for connectivity solutions in healthcare facilities. Due to the connectivity of healthcare facilities and devices, patient monitoring is done on real time basis, notably cutting down of unnecessary visits by doctors; also give them the chance to utilize virtual infrastructure of cloud computing to make informed decisions and offer evidence based treatment. Growth is mainly driven by government-sponsored programmes enabled by better healthcare infrastructure and data storage facilities. Moreover, connected healthcare solutions provide ease to the patients to consumer healthcare services and help the medical experts to provide better and efficient cure to the patients. Although connected healthcare is transformational in healthcare sector, it presents multiple challenges related to sensitivity of health data. Furthermore, streamlining and digitizing health data as well as its expanded use, strain the data centers. Data security is another risk that is likely to increase with the volume of data hence the need to shield information from cyber attacks. Connected healthcare service providers are facing challenges in developing countries due to lack of connectivity infrastructure. Dearth of medical facilities and less availability of healthcare professionals in under developed nations is one of the major factors which are restraining the growth of connected healthcare market.